Today I am so excited to share a new quilt block tutorial. I call it, Going Dutch. and (2) 1 1/2" x 1 1/2" squares. Using your ruler, draw a diagonal line from corner to corner on the wrong side of (4) 2 1/2" x 2 1/2" background squares and on all of the focal fabric squares. Lay your marked background squares on your 4 focal fabric rectangles aligned at the top with rights sides together as shown. Pin both sides adjacent to that drawn line. Make sure to put them out far enough that your presser foot won't hit them as you sew on by :) Now, place your (4) 1 1/2" marked focal fabric squares aligned at the bottom right with right sides together as shown. Pin as directed earlier. Stitch a seam directly on top of your drawn line for all 8 seams. Align your ruler 1/4" over your stitched line. Cut along the edge of the ruler. Scrap your loose triangles. Press your seams. I found it easiest to press my seams open, but press as you prefer. Set these 4 pieces aside for the moment. Align your ruler along the drawn center line. Cut along the edge of the ruler. Press your seams. Once again, I pressed mine open. Gather (4) 2 1/2" background squares and lay them out as follows. Place the HST onto the background square with right sides together. Stitch a 1/4" seam along the edge. Pin if desired :) Press the 4 seams. And now your pieces are all made and you are ready to sew the block together. Lay your 8 pieced rectangles out as follows creating 4 quadrants. Now sew the top 2 squares into a row and the bottom 2 squares into a row. Place the right square onto the left with right sides together and pin along the edge taking care to match up your little triangle seams. They will lay right on top of one another and it is important to get those pretty points in the center that the line up. Press your seams. And one last seam to sew. Place the top row onto the bottom with right sides together. Match the center seam and the little triangle seams once again. Pin them in place. Sew a 1/4" seam along the pinned edge. Press the seam. And now sit back and enjoy your cute little 8" Going Dutch quilt block!! And here she is in solids. Isn't it fun how different fabrics can create different looks, that is one of my favorite things about quilting!! 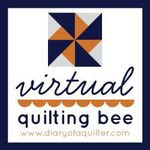 Be sure to add your Going Dutch quilt block to the Virtual Quilting Bee Flickr Group as well as the Inspired by Happy Quilting Flickr Group. EDIT - Some of you have inquired about making this block on a larger scale so I whipped up this little chart of the fabrics you need to cut for 5 different block size options. Note, the last line of the chart isn't fabric that needs to be cut, it just gives you a reference of what size to trim your Half Square Triangles :) Have fun :! Hope you have enjoyed the tutorial ;) Have a Happy Quilting Day!! This is adorable, looking forward to it! Wow, this block is ingenius! It looks so much more complicated than it actually is. Beautiful. Lovely blocks, especially that one in solids (stunning)! I love this block Melissa, thank you for your tutorial ! That is a great looking block. Thanks for the tutorial. I love pinwheel blocks and this one is fabulous. Thanks for the tute. Melissa!!!!! This block is amazing!! I just LOVE it!! The tutorial is so easy to understand as well!! Thank you! You rock! Nice block. I am in a block swap and that would make a great block pattern to use. Stopping by from Finish It Up Friday over at crazy mom quilts. I love how you've taken a basic pinwheel block are transformed it into a block that is so unique! Lovely block, I'm looking forward to making this tomorrow. I wonder how it would look sized up? Maybe doubled? great block, thanks for up sizing it for us. You are the best! Great square, love the blue. surprise! Thank you for such a lovely block and a really easy-to follow tutorial. I've sized it down to make a 6" block for my Farmer's Wife quilt as some of those in the book are a bit tricky to work out. Wow! Beautiful block, and thanks for the size chart . I'm working on a 12" block of the month which needs 4 more blocks to make it square. I'll add this to my collection. Melissa, you're the best! Thanks so much for the size chart. I'm thinking of making an entire quilt out of this block I love it so much! sooo pretty and fun!!! Thanks for all your great tut's. They are always concise and easy to follow. Thank you for your work on this block! It looks fun to make, but wow...lots of work for you! Thanks for passing on such good instructions! This is an amazing block. Rather than increasing the size, I'm making these 6" (a Splendid size).